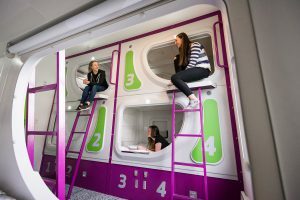 Stockholm – May 16, 2017 – JUCY Snooze, a unique Pod-hostel accommodation concept from JUCY New Zealand, opened its first property at Christchurch Airport in late 2016, with the installation of ASSA ABLOY Hospitality Mobile Access for keycard-free entry and security. JUCY Snooze Christchurch is currently using the ASSA ABLOY Hospitality app to implement Mobile Access using VingCard Signature RFID door locks. Self-check-in stations have also been installed to eliminate the need for a traditional guest reception. The VingCard Signature RFID door locks offer state-of-the-art security and provide the control and accountability that travellers and property operators expect from today’s systems, along with all the benefits of Bluetooth Low Energy (BLE) technology. The self-check-in stations offer quick access and ease-of-use for guests, so that guests staying at the new Christchurch property can use the kiosks to check in without standing in front desk lines, cutting down on check-in “bottle necks” and delivering a more efficient process for guests and staff alike. ASSA ABLOY Hospitality Mobile Access delivers unparalleled security through secure Seos technology, assigning guest rooms and creating encrypted digital keys, so guests can use personal smart devices to unlock their rooms at the JUCY property. These keys are delivered securely and kept safe within a digital vault on the ASSA ABLOY Hospitality app, so unauthorized users cannot gain access to the key or room. These digital keys are transmitted over a secure communication channel only when presented to the appropriate lock. ASSA ABLOY Hospitality mobile access can also be integrated into a hotel’s already-existing proprietary app. While considering other options on the market, the JUCY management team ultimately chose ASSA ABLOY Hospitality’s innovative solution due to the team’s professional approach to the project, local support in New Zealand and proven track record of success on a global scale. The team at JUCY embraced the complete mobile key concept solution that ASSA ABLOY Hospitality provides. The global leader in hotel security technology, ASSA ABLOY Hospitality has products installed in over 42,000 properties worldwide, and is part of the ASSA ABLOY Group, a publicly listed company. ASSA ABLOY Hospitality’s comprehensive range of security and technology solutions comprises VingCard electronic locks, Elsafe in-room safes, integrated software platforms and advanced mobile access solutions. ASSA ABLOY Hospitality has worldwide service and support in more than 166 countries. For more information, please visit www.assaabloyhospitality.com.